Democratic Republic of the Congo on a Vespa scooter! I don’t know what’s going wrong with me. The last month I’m trying to write about the amazing experience I had traveling through both Congos and I cannot write a word! So until I manage to express myself, have a look to the second part of the video I made. If you really enjoyed the video “like” it and “share” it!!! OH MY GOD, these roads are unbelievable! Quick question if I may: these crazy roads are the main highways over there or you were going off the beaten tracks? I’m not sure I want to know the answer actually!! ahahahah. Keep going, love it! Hello Romain, thanks for the comment! Yes, these roads are the main and only connection between Kinshasa and Lubumbashi!! 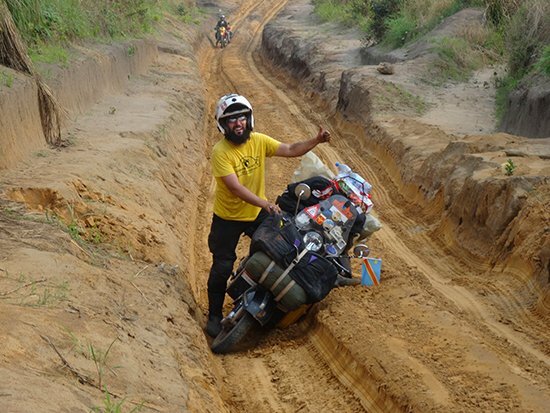 Unfortunately (for the locals but fortunately for me because I loved the whole experience) there are almost no highways or even tar roads in D.R.Congo and if you want to cross the country you have to pass from these exact roads! Στέργιο απολαμβάνω πάρα πολύ να βλέπω τα videos σου.Σαν να βλέπω ντοκιμαντέρ ήταν αυτό.Μπράβο!